Hows your Go Large download speeds these days? 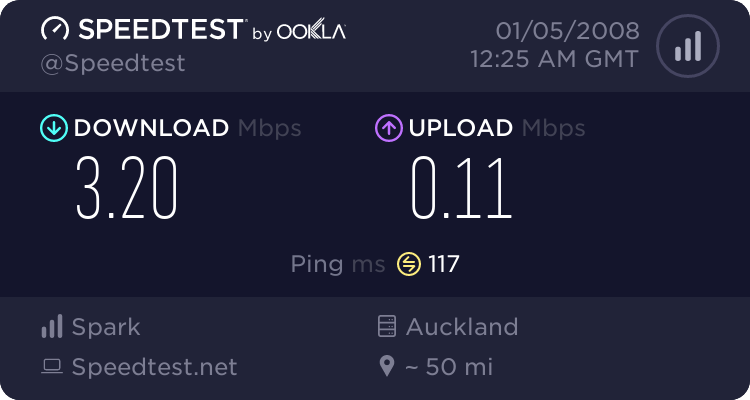 Forums › New Zealand Broadband › Hows your Go Large download speeds these days? This is what I get from the techs at telecom, go large basically you share your tiny 64Kbps bandwidth with other users on your node. So .... get out of the go large plan, it is now no longer available/valid anyway. zocster: This is what I get from the techs at telecom, go large basically you share your tiny 64Kbps bandwidth with other users on your node. So .... get out of the go large plan, it is now no longer available/valid anyway. Who said anything to do with 64kbps??? I only got the info from the tech at telecom when a friend of mine rang up when he noticed that his speed got slower and slower. I am only passing the message on. Go Large is not subject to throttling to 64kbps so 64kbps has no bearing on it. Many connections on Go Large can pull down more than 64kbps (see also Tonys, Fossies, or my old folks connection), you may be confusing the the 64kbps connection speed with the traffic 'management'. I got told my a telecom call centre lady that i should be getting 600+ on go large. cokemaster: Go Large is not subject to throttling to 64kbps so 64kbps has no bearing on it. Many connections on Go Large can pull down more than 64kbps (see also Tonys, Fossies, or my old folks connection), you may be confusing the the 64kbps connection speed with the traffic 'management'. Possibly! Thank god for cable. Its nothing to do with the technology providing the internet service (I'm getting 13mbps international on DSL right now), but rather the plan + associated traffic management stuff. 64k eh? And I was getting high 4000's last night. i havent used download managers since the dark ages.... (when i was on dialup) they were good for resuming lost connections and queuing up downloads, what others do you guys recommend? ive heard of dap and am about to try it..... any others? Good on the people who are getting fast speeds on Xtras Go Large.... for the people that complain that they arnt getting fast speeds who are on this plan, what do you expect? You are on a budget plan, its cheaper for a reason.... its budget! If you want a faster plan, pay the money like everyone else and stop complaining. There is no 700mb limit. That was canned and they just apply management to your plan 24/7. That's why you got a juicy refund. $50 a month is NOT cheap. And when i get top speeds of 25kb/s i feel like I have the right to complain. Spoke to a mate who is on Go Large just today and he said it was steadily getting slower and slower as it's all just a few leechers now. I'm amazed Telecom has not pulled everyone off it by now. I do not spend all day downloading illegal Moviez, Torrentz, Mp3z and Warez so I don't need this "safety net" stuff. Ugh, If I'm going to torrent then I'm happy with slow speeds etc, I deserve it as most people who torrent do - 99% of the time your doing things you shouldn't be with it, I know you can get Linux ISOs faster in torrents(In America, But deff not NZ!) but I mean I'm sure people are much more likely getting the distro from the original source! I use Xnet, $1 per GB, always the much better option - Why do people even stick to go large? at 25kbps you would only just get to 16GB ( $50 ~ on the Xnet river plan), and even if you go over its only a couple of Dollars more! I don't know if this reply had much point, only to show unless you know how to make the most of it, there is no real reason for you to be on the plan and not another one.